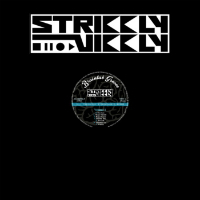 Strikkly Vikkly gets dub-ly jubbly here on his debut long player Volume 1 which takes the meaning of the phrase ‘soon come’ to ludicrous lengths what with the album dropping, as it does, some sixteen years (!) after his self-titled ‘single’ which was released on Stubborn Records’ Version City Dub Clash comp. in ’99. Lucky it’s worth the wait then. For this drop it’s Italian label Brainlab Groove who pick up the release baton and have overseen the launch of Volume 1 with its Black Ark studio vibe. And it’s all about the old school dub vibe on this fourteen tracks’ worth of bass worship – in fact whack this on while you’re on the wacky baccy and you’re practically guaranteed a religious experience. And just so you know SV is guided by Jah – this is the best fourteen tracks from live sessions in which all the instrumental arrangements were live improv. Allow the monkey to guide you particularly in the direction of insistent opener Dee Gee, the uplifting all-night mellow of Bubble Tea (what else?) and the pulsing funky organ skank of Bee Bee.